Flying Lead Change! Following God’s Lead! Though I would never consider myself of a horse person, I appreciate the beauty and grace of flying lead changes. Both horse and rider must become proficient to make these smooth, clean changes of direction in perfect balance without breaking rhythm or losing forward momentum. In a flying lead change a horse changes leads without changing the rhythm of a canter. It is similar to skipping from one foot to the other, but on four feet instead of two! While watching horses canter around an open meadow you would notice how beautifully and freely they naturally accomplish this. Add a rider to the mix and it becomes a little more complicated. Both horse and rider must develop a unified rhythm, trust, freedom of gait, perfect contact, straightness, alignment and balance. The rider must become “one with” the horse, in tune with the horse’s natural rhythm and timing. The discipline is nothing short of frustrating to master, but when accomplished successfully there is an awareness of genuine power unhindered. The beauty, elegance and power of barrel racing, pole bending, dressage or many other equestrian disciplines is often a result of graceful flying lead changes. In full motion, the center of gravity shifts, the subtle cues of horse and rider are instinctively responded too. Nothing is lost! Everything is gained! “What got you thinking equestrian?” you ask. Lately, I’m having trouble “skipping” to God’s time and smoothly following His direction! Gracefully leaping through life is not an apt description of my walk with Him. There is nothing wrong with the Lord’s leading, of course. However, as He calls me to change direction or adjust my focus, personal insecurity, hesitancy, and imbalance create a frustrating, out-of-step cadence within me. Like a stumbling novice I clumsily respond to His directing. I am unable to proceed beyond a slow trot. What beautiful imagery! God leads His children like a horse into open country where there is perfect liberty or like cattle to peacefully rest in an open meadow. Do I trust His lead! Trust is necessary for flying lead changes. To trust means I need to lay down preconceived ideas of where I think I should be heading and the pace I want to get there. Personal agendas must fall! Who really has the reins in my life? It is an easy question to ask; it is much harder to honestly evaluate my heart! As a matter of fact, I can believe I am doing quite fine, until God asks me to step into a new lead. Then reality sets in! Just like a horse needing blinders to avoid distraction and loss of focus, God often needs to allow circumstances to hem me in to get my full attention. I hunger to sense the shift of His rhythm and bend in fluid motion to His every movement. My sister owned a mature cutting horse. Countless times I toppled off the side or plunged over the neck of this amazing responsive horse. Duchess turned on a dime and stopped instantly to the slightest touch of the reins. She was sensitive; I was not! It took time to develop a trust between us that would enable fluid movement and unison. Sometimes horse and rider fight for dominance. It can be a serious battle of wills. Every rider has met this challenge. Time and energy can be wasted grumbling and arguing over God’s lead. Even though it may not make sense to me, a flying lead change requires that I don’t know all the answers or outcomes. Not only is a high level of trust necessary, I also must be convinced of the nature of The One who is asking me to redirect. Often grumbling is rooted in my personal insecurity. Will I honestly acknowledge my frailty and embrace my struggle. Surrendering in childlike humility to my Heavenly Father always knows best is not an option. Step by step I AM WORKING toward my personal flying lead change! It may not look or feel “graceful” today, but with practice and time it will! By embracing even the points of failure, I am preparing for success. I am learning much from present disappointments. He didn’t want his children to quit before they tasted success. I think Dad reflected the Father’s heart toward us. Here is the essence of a flying lead change – understanding hearts fully expressing God’s love plus the endurance, or perseverance from Christ. What a perfect mix! When God sees us flounder or break rhythm, He is never discouraged or disappointed with us. Gently, He invites us to try again. He picks up the pace, whispers a new direction, and welcomes us to respond. 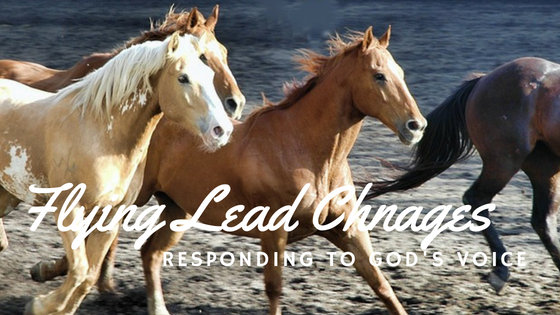 When we begin to respond instinctively to His lead, we will rejoice together! The beauty of our flying lead change will be obvious to everyone watching.